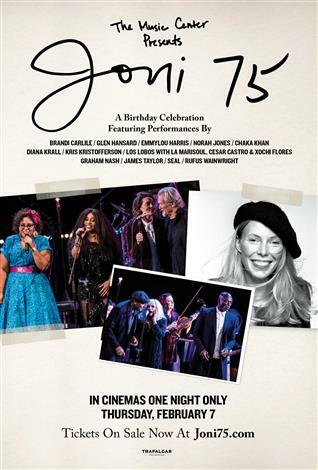 Audiences will join an incredible array of singers and musicians who came together to honor one of the world’s most remarkable artists, Joni Mitchell, on her 75th birthday. The hand-selected group of peers and protégés including Brandi Carlile, Glen Hansard, Emmylou Harris, Norah Jones, Chaka Khan, Diana Krall, Kris Kristofferson, Los Lobos with La Marisoul, Cesar Castro & Xochi Flores, Graham Nash, Seal, James Taylor, Rufus Wainwright and more paid tribute to the iconic artist, performing songs from all stages of Mitchell’s life and career, across her entire catalog of 19 studio albums. Captured over two nights in November 2018 by The Music Center at the Dorothy Chandler Pavilion in Los Angeles, the entire concert, along with special behind-the-scenes interviews with the artists, will be shown in movie theaters for one night.